The numbered hand silk-screened records are sold out. Look for a 2nd edition with a different cover (same colored vinyl) soon. Records can also be obtained in Tucson, AZ at Old Paint Record Shop and Wooden Tooth Records. 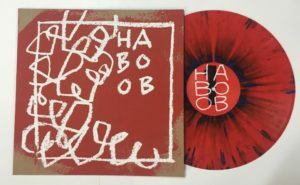 Haboob will also be selling a limited amount of records at their live shows. Haboob announces the official record release party for their self-titled vinyl record at Tap & Bottle on Thursday Nov. 10th, 2016 at 8:30pm. Special guests, party favors and great music will be had. Double drums will be played by Ben Schnieder and Dimitri Manos (Krab Legz). Nick Letson (Asian Fred), Ryen Eggleston (Golden Boots), Clay Koweek (Loveland), and tidypaws (Tropical Trio) will also play. Special Guests are TBD. There will be a food truck parked just outside the front door and the weather is going to be fantastic- everybody says so. Vox Urbana- East Coast Tour 6/12-6/19! Join Haboob for an evening of music and stargazing. 2nd and 4th Tuesdays, 8:30-10:30. Free and all ages. Sky Bar is on 4th Ave. in Tucson, AZ. It adjoins Brooklyn Pizza and is just north of 6th St.
Haboob (Jazz Telephone) will play Sky Bar from 8:30-10:30pm on Tuesday 12/29. There will be no show on Tuesday 12/22! Jazz Telephone changes name to Haboob!! In a startling turn of events, Jazz Telephone has changed names to Haboob. No reason was given. Haboob, formerly Jazz Telephone, plays original music- music that elicits feelings of ennui and hubris. Sax, organ, bass and drums provide a resonate palette with which to paint a vast and visceral landscape of love and hope. French Telephone is the French iteration of Jazz Telephone, formed to play original compositions written by Jeff Grubic. French Telephone played on July 9th, 2015 in Nantes, France at Stereolux in conjunction with the So Film Summercamp Festival. French Telephone: Jeff Grubic- sax, Enid Pifeteau- organ, Stephane Louvin- guitar, Matthias Moreno- drums, Benoit Guchitet- bass. In conjunction with La Nuit du Van in Nantes, France, Grubic’s Cube, a large metal cage, was built, inside of which a band played for four hours until impeded by thousands of balloons inflated by passers-by. The musicians: Jeff Grubic- sax, Enid Pifeteau- organ, Stephane Louvin- guitar, Matthias Moreno- drums, Benoit Guchitet- bass. Special thanks to Laurent Marechal and Greg! This show is on Friday 3/27 at 7:30 at Exploded View Microcinema. Celebrated experimental filmmaker Dominic Angerame (SF) makes a special appearance at Exploded View, screening his film cycle that explores the unprecedented change in the urban landscape of San Francisco. Chronicled in beautiful black & white celluloid, Angerame poetically questions the role of human labor and the unintended consequences of progress on a city in chaotic flux. Tonight we screen films in both 16mm and video, including Deconstruction Site and In The Course of Human Events. Opening the show and accompanying Angerame’s films Continuum & The Soul of Things is sax master Jeff Grubic’s Jazz Telephone! !